Home » Blog » We Have Doors! 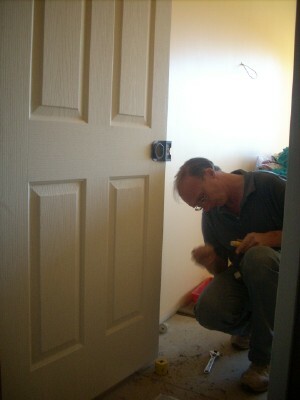 PC hung all five doors last weekend and this, his skill and speed in hanging doors is impressive. It has been so long since we’ve had doors, door knocking is a novelty. Our bedrooms are much warmer now. 6 Comments on We Have Doors! and just in time for your visitors too! Way to go PC. Congratulations =) Took us four years to hang doors on our bedroom robes ! Wow! The place must have really changed these past few months! Good to hear the work is progressing. giggling, I believe it took my father longer than that. Mine were doing that in the shop the other day, embarassing.